To realize the joy of argument and all the wonderful things it can bring, you need to think about and say things that matter. Don’t just say things because it feels good to say them. Say things because they are relevant and help prove your point. Start by arguing relevant facts. And spend most of your time on the most relevant facts. A fact is relevant if it tends to prove your point; these are the facts you emphasize when you are proving a point. For example, let’s say you argue that there is an economic recession. Relevant facts would be decreased income levels, decreased gross domestic product (GDP), decreased consumer spending, and increased unemployment. These facts, if true, would tend to prove your point. But before you declare victory, keep in mind that a fact is also relevant if it tends to disprove your point; these are the facts your opponent emphasizes when he tries to prove you wrong. Increased income levels, increased gross domestic product, increased consumer spending, and decreased unemployment, if true, would tend to disprove your point. These facts make up the “other side of the coin,” and you should be aware of them if they are true. So it’s important to identify the relevant facts in an argument. But it’s not enough to simply argue relevant facts in an argument. To persuade, you need to argue the most relevant facts. Let’s say you and a friend are arguing about whether there is an economic recession. Your friend says, “I just came back from Dubai. The business-class lounge was packed. The plane was completely full. Where’s the recession? I don’t see any recession!” Is it relevant that the business lounge in Dubai International Airport is full? Sure, a busy airport is a sign of economic activity. But is this the most important fact as to whether there is a recession? Probably not. First, airports tend to attract people with money, so an airport is not always the best barometer of general economic conditions. Second, airlines have been running their planes fuller in recent years because of consolidations, partnerships, elimination of unprofitable routes, technology, and fuel costs. And many seats are taken by off-duty airline staff and passengers using frequent-flier miles. These factors don’t tend to indicate the end of a recession. So the most relevant facts in this argument are probably broader economic statistics–for example, income levels, unemployment, GDP, and consumer spending (a tiny fraction of which would be found in the business lounge). The most common flaw in bad arguments is saying stuff that is not relevant. Most bad reasoning comes down to saying things that don’t prove, or even tend to prove, the point. Say things that matter, and especially the things that matter most, and you stand a much better chance of persuading. We argue because we disagree. And that’s OK. A world where everyone agreed on everything would be unproductive, unoriginal and boring. When you enter into an argument with someone it may be apparent at first where your opinions differ. But after an argument has gone on for some time, it’s easy to lose track of what points have been conceded, and where dissension still remains. If you’ve argued with a person for a while, and he or she still doesn’t agree with you, you need to know why. So if you don’t already know, ask. That way you can focus on points that will persuade, rather than waste time and effort on points the other person already agrees on or doesn’t care about. Simple questions like these force the person with whom you are arguing to stop and reconsider his or her feelings about the topic at hand, and reevaluate what exactly it is you’re arguing about. This is a useful tool when the argument seems to be getting off track, or you begin to feel you’re talking each other in circles, unable to move on from a particular point. Find out exactly what the hang-up is so you can address it. Portions of this blog post were excerpted from The Joy of Argument by Albert Navarra. If you’d like more information on how to hone your communication skills through argument, check out The Joy of Argument in paperback and e-book formats here. If you can’t find your keys, and you search your entire car, and you don’t find your keys in your car, it’s okay to say your keys are not in your car. You are making an argument based on lack of evidence. This argument is valid because you searched the entire car. If you argue that aliens do not exist because you have never seen evidence of extraterrestrials, you are also making an argument based on lack of evidence. But this argument is not as strong, because you have not searched the entire universe for evidence of aliens. In fact, you probably have not even searched a significant portion of the universe. So the lack of proof of extraterrestrials does not necessarily prove that extraterrestrials don’t exist. Maybe they do exist; you just haven’t looked in the right places! These examples illustrate how carefully you must examine lack of proof in an argument. On first glance a lack of proof may indicate that something does not exist. But this is only a valid conclusion if all possible sources of proof have been explored. Some arguments have a conclusion that provides certainty, while others have a conclusion that only provides a probability. Be careful when arguing about lack of proof. What may at first appear to be a strong defense, could easily end up to be an assumption based on lack of evidence. Ernest Hemingway said, “The world is a fine place and worth fighting for.” What does “the world” mean? It could be macro issues, for example, human rights, social and economic policies, and international peace and prosperity. If you care about these issues, they are certainly worth promoting through sound argument. But “the world” can also mean your world, in an individual sense–for example, your health, your work, and your relationships. These issues affect you differently and are worth improving through sound argument. So when you think about it, there are as many reasons to argue as there are reasons to live. Your life itself is an argument, a statement of your beliefs and values, and what is important to you. Argument is a tool we can use to exercise our freedom of speech. We express ideas, opinions, problems and solutions through argument with the intention to make society better. Within this “marketplace of ideas,” the best ideas will eventually rise to the top, and good argument allows this to happen faster. 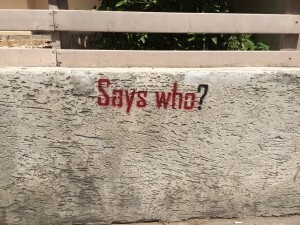 When you understand how to effectively argue, you can use argument as a tool to better your life, expand your world view (and the views of others), and on a basic level, communicate more effectively. You can cut through irrational, emotional and irrelevant arguments and emerge victorious, leaving you to celebrate the triumph of truth. But argument is a skill that doesn’t come naturally to many people. Arguments that are too complicated will result in confusion. Arguments that are founded in emotion, often result in conflict. Without properly preparing yourself for an argument, your chance at accomplishing anything through discourse is slim. 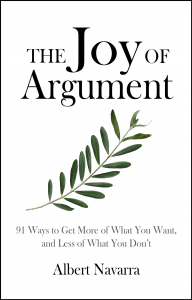 The Joy of Argument by Albert Navarra was written to help the everyday arguer, as well as professionals, become experts at argument. This book breaks down argument strategies and best practices into easily usable bits of information for a fast, worthwhile read. From body language, to hot words, from leading questions to recognizing victory, The Joy of Argument covers all stages of argument from preparation to practice. To start learning how to use argument to get what you want, pick up a copy of The Joy of Argument here. If you are a reviewer, blogger, or member of the press, you’re welcome to contact us here to request a review copy of this book.